AMD single bridge A75 chip board architecture. The AMD A75 chipset motherboard architecture is shown in figure 1. Figure 1 AMD A75 chipset motherboard architecture diagram. The management and support functions of the AMD A75 chipset motherboard are as follows. ①The AMD A75 motherboard uses FM2's CPU. ②FM2 outputs video signals that support VGA analog signals, HDMI HD multimedia interfaces, and PCI-E X16 standalone video card slots. ③FM2 CPU also integrates memory controllers to manage memory to support up to 1866MHz memory. ④FM2 internal integrated network control module manages the 1000MHz Nic chip. 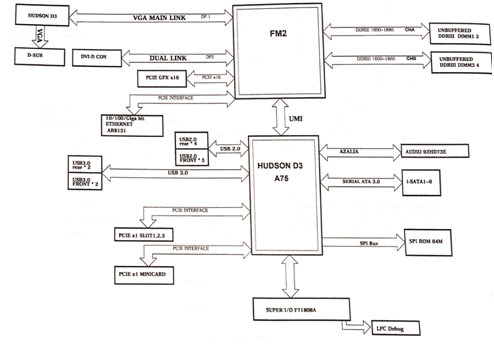 ⑤Bridge is referred to as the connection between the FCH, and the APU using the UMI bus. ⑥FCH management USB 2.0 interface, USB 3.0 interface, sound card chip, SATA hard disk interface, E-SATA external hard disk interface, PCI-E X1 slot, MINI PCI-E slot and SPI BIOS. ⑦FCH manage IO chip through LPC bus. ⑧IO chip management LPC interface.